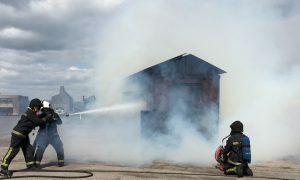 Foam testing is crucial in ensuring that stocks of foam concentrate held in long-term storage are in good condition when they are needed to put out a fire. It is impossible to tell if foam concentrate is of operational quality by smelling it, looking at it in its drum, or touching the finished foam blanket. Foam users around the world submit samples of foam concentrate to the award winning Angus Fire Foam Testing Service as part of their regular maintenance programmes. Teams of highly qualified scientists and technicians in modern, purpose-built laboratories analyse samples of all types of foam to the highest standards. With knowledge and experience of evaluating foam samples gained over many years, Angus Fire staff are uniquely placed to interpret the results and provide reliable recommendations about the suitability of foam for use in an emergency. Analytical chemistry laboratories that do not specialise in fire fighting foam testing are unable to offer such specialist expertise. The results are reported quickly with a comprehensive test report. Find out more in our Foam Testing Brochure.